A fishing trip cost two Wolverhampton men more than £600 each, after they were caught without a licence and illegally removing fish. Dumitru Stancu, (24) and Adrian Diaconescu (21), both of Newhampton Road West, Wolverhampton, were found guilty in their absence at Telford Magistrates’ Court on 26 November for using an unlicensed fishing rod and line on the Shropshire Union Canal in Telford and for contravening a national byelaw of removing fish without permission, on 3 June 2018. Both men were fined £440 and each ordered to pay costs of £127, plus a £44 victim surcharge. 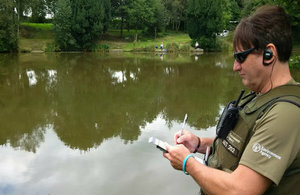 An annual fishing licence costs just £30, yet a small number of anglers continue to flout the law and risk prosecution for fishing without a licence and breaching byelaws in place to protect fish stocks. It’s important anglers have a licence before fishing; the money from licences is invested into England’s fisheries and rivers; improving the sport of angling. Anglers should also ensure that they are familiar with our byelaws, which are available on the Environment Agency web pages. Environment Agency officers are out checking licences and byelaw compliance regularly throughout the year. A licence costs just £30 and lasts for 12 months from the day it is purchased, and becomes valid around 30 minutes after buying online. Money from fishing licence sales is invested in England’s fisheries and is used to fund a wide range of projects to improve facilities for anglers including; protecting stocks from illegal fishing, pollution and disease, restoring fish stocks through re-stocking, eradicating invasive species and fish habitat improvements. Fishing licence money is also used to fund the Angling Trust to provide information about fishing, to encourage participation in the sport and to manage a voluntary bailiff scheme. Children aged 12 and under can fish for free without a licence. Anyone aged 13 to 16 also fish for free, but does need to have a valid Environment Agency fishing licence. Anyone over 16 must pay for an Environment Agency fishing licence to fish for salmon, trout, freshwater fish, smelt or eel in England. Anyone witnessing illegal fishing can report it directly to the Environment Agency hotline, 0800 80 70 60. Information on illegal fishing and environmental crime can also be reported anonymously to Crime stoppers on 0800 555 111. 28 November 2018 Correction: Children aged 12 and under can fish for free without a licence. Anyone aged 13 to 16 also fish for free, but do need to have a valid Environment Agency fishing licence. 28 November 2018 First published.